Workflow in Solution Manager Change Request Management is the Approval Procedure. 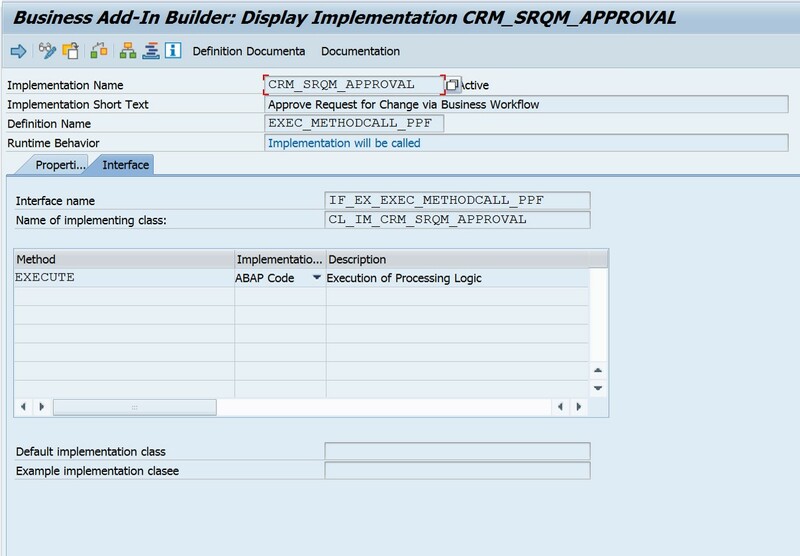 Starting with SAP Solution Manager release 7.10, the approval procedure assignment block from CRM standard was integrated, enhanced and used for Request for Change. The approval procedure allows customers to use an “approval workflow” that is executed during the Request for Change process when status is set to “To be Approved”. Customers can define several different approval procedures – each approval procedure consists of one or many approval steps. Customers can specify whether all the steps will be active for approval in parallel, or whether the approval steps have to be approved in sequence. If the approval procedure is started, approvers which have to take action get notified via email notification. The email contains a link in order to access the document and execute their approval step – once all the steps are completed the entire document is set to “Approved”, “Rejected” or stays in “To be Approved” only if all approvers choose ‘Not Relevant’. Approval procedures control the approval process for requests for change. In an organization, certain processes must be approved by the persons responsible, before they can be performed. For example, a request for change must be approved before an urgent or normal change can be made. An approval procedure is a process that is executed in the status “To be Approved” of the request for change. We can define multiple approval procedures and select one of them, depending on the type, impact or priority of the change. An approval procedure consists of one or more approval steps. Each step is assigned to a business partner function, and, in the change transaction, to a business partner. When creating or changing an approval procedure, you can specify which steps can be executed in parallel, and which only consecutively. We can control approval procedures using rule policies. Rule policies invoke specified actions automatically, when their conditions are satisfied. Rule policies are a set of rules, which are a combination of conditions and actions. Depending on the conditions, the system performs specified actions. We can define rules to determine the approval procedure or the approver for an approval step automatically, based on values in the change transaction. To determine which approval procedure should be used. To determine which business partner of the transaction should be the approver of a step. “Approved”: The approver has approved the change. “Not Relevant”: The approver does not want to participate in the approval. The step is not taken into account in the validation of the change document. You can register Change Request Management actions and consistency checks to all approval procedures. You have copied the standard transaction type SMCR, with all status and action profiles, into your namespace, using the copy report in SAP Solution Manager Configuration. If you use the option “Approving without Approval Procedure”, the PPF actions using HF_SET_STATUS which set the user status “Approved” or “Rejected”, are customized. you use this option, you can remove the Approval assignment block from your WebClient UI. How to create a new approval procedure? a) Copy the SMCR0001 approval procedure. b) Define and assign approval steps to the new approval procedure. Note: Assign only business partner functions to the approval steps that are also assigned to your change transaction type. Create rule policies, as described under Create Approval Procedure Rules. a) Copy the service manager profile AI_CM_AP_PROC. b) Under Properties, enter the newly created rule policy. a) Copy the SMCR0001 approval determination procedure. 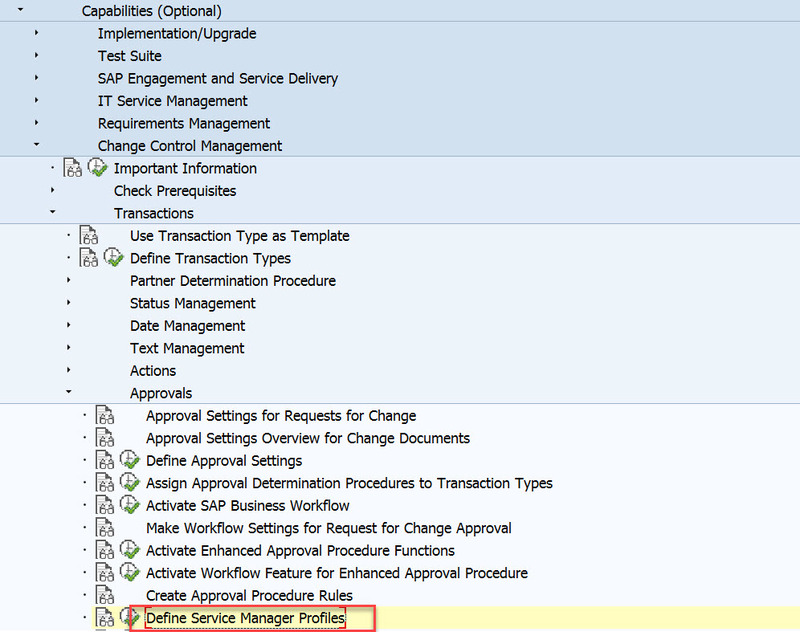 b) Assign the new rule modeler profile (that is, the service manager profile). Under Assign Approval Determination Procedures to Transaction Types assign your new approval determination procedure to your change transaction type. In order to use the enhanced functions, carry out the Customizing activity Activate Enhanced Approval Procedure Functions. Go to Request for Change-> Approval->Insert->Go to Step ID and click on F4; we will get the newly created values. How to edit approval option without approval procedure? To be able to set the status “Approved” for a request for change, you have created a PPF action which calls the method HF_SET_STATUS. The assigned processing parameter has the value of the status “Approved”. To be able to set the status “Rejected” for a request for change, you have created a PPF action which calls the method HF_SET_STATUS. The assigned processing parameter USER_STATUS has the value of the status “Rejected”. In the Customizing activity Define Action Profiles and Actions, choose the action profile of your request for change. 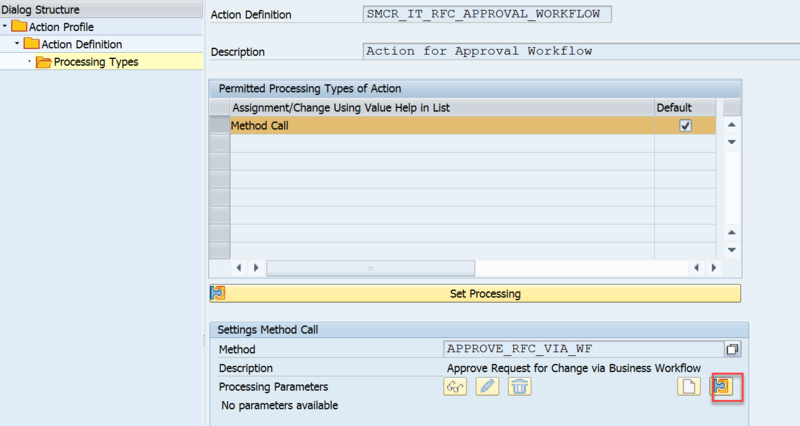 In the default delivery, this is SMCR_ACTIONS. Choose the action definition that sets the status “Approved”, and add the processing parameter APPR_RESULT, with the data type CHAR1 and the initial value A. Choose the action definition that sets the status “Rejected”, and add the processing parameter APPR_RESULT with the data type CHAR1 and the initial value R.
If you have assigned a substitute to an approver, the system also sends a workflow item for notification to the substitute. If you have assigned a business partner organization to approval steps, the system sends workflow items to all members of the business partner organization and to any substitutes specified. You have activated the enhanced approval procedure functions. For more information, see Activate Enhanced Approval Procedure Functions. 2.In the Object Type field, enter BUS2000116. 3.In the Delegation Type field, enter BUS2000916. 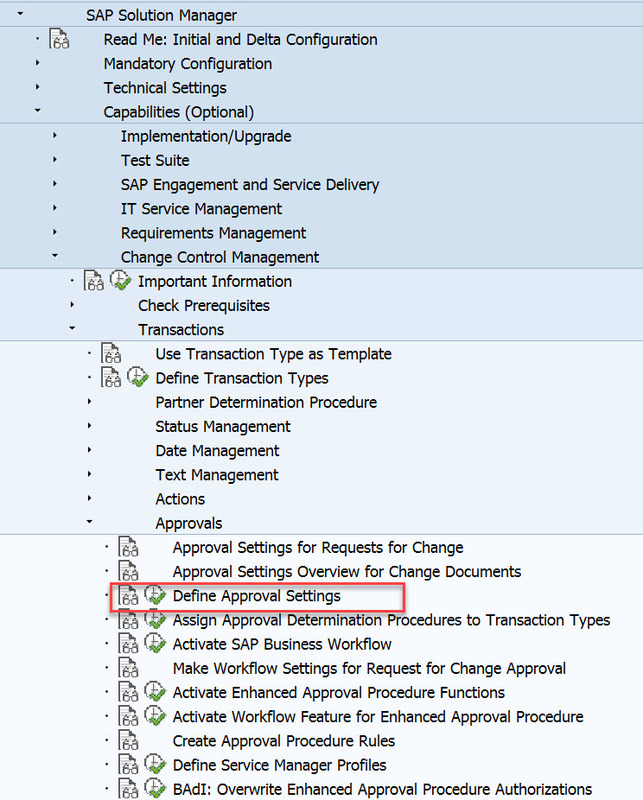 Restriction of the approval procedure functions using authorization object SM_APP_AP. Definition of a substitute who can also approve or reject your requests for change. In SWDD transaction create a new workflow. Go to Interface tab, double click on Execute and then modify the implementation. Thanks a lot for providing such detailed information on ChaRM approval procedures. Looking forward to more info like this from you.